Where do “good” institutions (those that facilitate efficient and equitable outcomes) come from and why do they evolve the way they do? Explaining Institutional Innovation argues that institutional innovation requires “tough times” during which leaders see themselves as highly vulnerable to internal pressures and external threats yet lack the means to address them. Analyzing business associations and states in Latin America, private sector organizations in China, the Office of the Historian of Havana, the Association of Caribbean States, Caribbean universities, and sugar industries in the Philippines and Brazil, contributors affirm the vulnerability approach by demonstrating how various types of crises precede and stimulate institutional change. Richard F. Doner is professor of political science at Emory University and author of The Politics of Uneven Development: Thailand’s Economic Growth in Comparative Perspective. 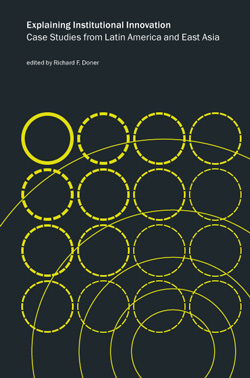 Explaining Institutional Innovation: Case Studies from Latin America and East Asia, ed. Richard Doner (New York: Social Science Research Council, 2010).